Many rangeland/grazing areas possess forage and shrub species that are considered poor quality due to the presence of antinutritive factors such as phenolic compounds and tannins. 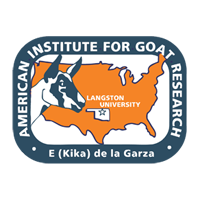 Goats are known for their ability to consume tannin-containing brush and can utilize forage and shrub species containing tannins and phenolic compounds at levels that prohibit their use as feeds for sheep or cattle. Water oak (Quercus nigra) and shining sumac (Rhus copallina) are two examples of shrub species present in grazing or woodland areas that may contain antinutritive factors. Therefore eight Alpine wethers 8-9 months of age were fed diets consisting solely of dried leaves of water oak or shining sumac. Feed intake was similar between the two types of leaves, averaging 616 grams or 2.24% of body weight. However, based on higher digestibilities for water shining sumac than for water oak (for example, 64 versus 42% apparent organic matter digestibility), nutritive value may be greater for shining sumac. This ability of goats to consume and derive nutrients from such plants is one of the reasons why goats are often used to control or eliminate brush and other undesirable forage species from pasture lands and to rehabilitate pastures.